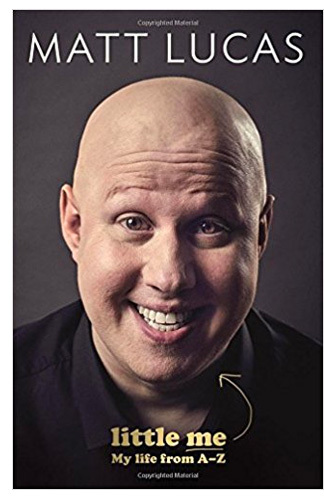 There are two men who don’t feature quite as prominently as you might expect in Matt Lucas’s autobiography, though their presence is frequently felt. The first is David Walliams, with whom he worked so closely for 15 or so years, peaking with the A-list comedy stardom of Little Britain that means they will be forever intertwined in the public’s mind. Yet it frequently felt in his writing, and there are insights into how he tried to cope with Kevin’s death. The take-out headline was that in his anguish Lucas went on an ‘empty sexual rampage’ before setting up anew in America, where everything didn’t remind him of the love of his life. Despite sparing us somedetails, Lucas appears frank within the boundaries he sets himself. Like a many a comedian, he’s built a narrative around his insecurities and differences, and can be self-effacingly witty about them. The most obvious thing that made him stand out was his early onset baldness, losing his hair at the age of six in what was – probably wrongly – ascribed to the shock of being hit by a car two years earlier. Cures, creams and a very odd acupuncture treatment that should probably have been reported to the authorities failed to address the problem, ensuring he was always a source of ‘amusement, sympathy and revulsion, and occasionally a magnet for bullies. His sexuality is certainly another major defining characteristic. In the late 1980s ‘gay’ was an insult, or the punchline to a sick joke. Lucas spent a long time at Haberdashers’ Aske’s, the posh North London school which also produced Sacha Baron Cohen and David Baddiel, convinced that sooner or later he was going to fancy girls; it was just a matter of time. He never did. Accepting that he was gay caused issues from discomfort to trauma – and his brother, to whom he was close, certainly struggled to accept it, even boycotting Lucas’s wedding (though in the end he turned up and eavesdropped outside the door). No wonder Lucas hopes that the world has come on enough that teenagers now will not have to write tortured ‘coming out’ chapters when their future biographies come out. Lucas was 25 before he’d even kissed anyone, and even then: ‘My heart didn’t soar… after a while a put a merciful end to the whole thing.’ Maybe there was just too much expectation. It’s hard to think that when he first appeared as the romper suited scorekeeper, he was still a baby in comedy terms, too, combining his work on the Reeves and Mortimer show with his studies at Bristol University, eventually dropping out when it appeared comedy was going to be viable career. On reading a draft of this book, Lucas’s mum said ‘it’s all a bit tears of a clown’ – but although plenty of the more recent history is tinged with heartbreaking sadness, he predominantly strikes the same breezily entertaining tone that makes him such a dependable chat show guest - with stories told with wit and honesty, even if he might be carefully rationing the latter. The impression is of a man with some issues, but trying hard not to use them as an excuse for being anything other than a decent man, and he certainly talks about fame without being arrogant or displaying a self-consciously false humility. Those traits combine in some anecdotes about encountering fans when he wasn’t at his most level-headed, and feels he let himself down, failing in his duty to be cheerful and ‘on’ in the face of endless selfies and stolen glances. People seem shocked to see a famous face walking among them, sitting in economy. But ‘despite what you may read, most celebrities don’t earn anything like what you might think,’ he adds. Despite Lucas’s protestations of having a modest income, he did manage to buy Kevin an actual Tardis from the Doctor Who set for his birthday (‘for a low five-figure sum’) – and a more expensive Dalek the next year… but it was too bulky to get through the door, and he doesn’t know where it is now. The private jet jibe suggests Lucas might seem ungenerous towards Walliams, but that is not the case, acknowledging that without him ‘I would have been less than half as funny’ and giving credit where it’s due – for example revealing that it was his former partner was responsible for Daffyd, ’the only gay in the village’. Yet it’s also clear the pair were very different creatures. At the height of Little Britain mania, Walliams wallowed in the celebrity lifestyle, snapped on countless red carpets with leggy blondes hanging off him, while Lucas preferred the cosy nights in with Kevin. Little Me: My Life From A-Z by Matt Lucas has been published by Canongate, priced £20. Click here to buy from Amazon for £9.99.